SAN JOSÉ, CA – Following a 24 year tradition of Concerts, and on this year, honoring the Romantic era (1825-1900), which saw the birth of the first celebrity pianists, who free themselves from the musical forms, imposed to them by the royal courts and the church, and began expressing themselves in individual, “romantic” emotional works, the STEINWAY SOCIETY The Bay Area, continued its Season with a RACHMANINOFF Concert by 21st-century Romantic Russian pianist VYACHESLAV GRYAZNOV. Born in Yuzhno Sakhalinsk, Russia, young GRYAZNOV started thrilling his audience in Russia with his piano mastery since his early childhood. 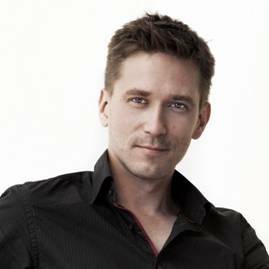 He studied music in Moscow, and graduated with honors from the Central Music School of the Moscow State Conservatory, where he continued as a Post Graduate student and is now on the teaching faculty of its Piano Department. The pianist’s fame is evident by the many awards he had received in international competitions, among them the Moscow Rubinstein competition and To the Memory of Rachmaninov competition in Italy. His fame continues to grow in Europe and in the USA, where he had appeared in prestigious venues like the Berlin’s Philharmonie and Carnegie Hall in New York. At the start of his RACHMANINOFF concert, which included Ten preludes , Op. 23 and Six moments musicaux, Op. 26, GRYAZNOV greeted his audience from the stage, walked to the grand piano, sat on the piano bench, with his back perfectly straight, shut his eyes and remained in silent, intense concentration for a few seconds. Then, he exercised his fingers over the keyboard, placed both hands on the piano keys, and began playing. His selection of RACHMANINOV’s Preludes were varied in their style, harmony, tempo, rhythm and difficulty. Each one demanding a different playing technique. The F sharp minor (Largo) Prelude was constructed on a four note theme that shifted all over the piano, sounding differently in the upper and lower registers, or changed and embellished. In his performance, the pianist allowed the theme to be heard clearly. More difficult in its execution was his second Prelude in B-flat major (Maestoso), which GRAYZNOV played majestically, allowing every note in the arpeggios to be heard clearly as his fingers ascended and descended the piano notes rapidly with his right hand and his left hand crossed over several times. The Prelude in D minor (tempo di minuetto), as its name indicates, is a minuette with a six-note theme, which is heard in different tonalities, perhaps because of modulations to different keys. More beautiful was The Prelude in D major (andante Cantabile), a romantic piece with no recurring theme, smooth in sound, but with contrasting dynamics including fortes. The Prelude in G minor (Alla Marcia) is called martial (suggestive of war) for its rhythmic elegance. It has a marked beat similar to that of the Spanish Flamenco dance, specially at the end, where the music increases in loudness. The Prelude in E flat minor (Andante) (written when Rachmaninoff's daughter was born) has a beautiful sound. It's four-note theme does not change, but sounds different when it shifts to the higher notes, the middle range notes, or to notes in the lower range. The theme continues to change sound until the Prelude end, when it gets embellished. In his C minor (Allegro), GRYAZNOV let his long thin fingers go wild, playing arpeggios up and down the keyboard. It was one of his best interpretations. It was followed by another fast piece, an A-flat major Prelude (Allegro Vivace) in which a theme repeats several times at fast tempo. It was also masterfully interpreted. His E-flat minor Presto was really fast. The Prelude is based on a 5-note theme and a series of fast scales whose notes seem to climb in rapid succession before sliding downward. The piece was difficult but playing arpeggios and octaves ascending and descending at fast speed seem to fit the dexterity of the pianist long fingers. He knows he is good doing it and he seemed to enjoy the challenge. The first part of the concert ended with a a G-flat major (largo) Prelude. The Six Moments Musicaux Op. 16, written by RACHMANINOFF to be sold, present difficulties to any pianist. They include a B-flat minor (Andantino), an E-flat minor (Allegretto), a B-minor (Andante Cantabile), an E-minor (Presto), a D-flat major (Adagio sostenuto), and a C major (Maestoso). The Allegretto, as its name indicated moves very fast changing the theme from one hand to the other which the pianist easily mastered; the Andante Cantabile, which he made it sound beautiful, and the C major (Maestoso), which sounded majestic. During his February 10th SERGEI RACHMANINOFF Concert at the TRIANON THEATRE, GRYAZNOV kept his audience captivated; yet what got him the longest standing ovation that afternoon, was his encore, PETER ILYICH TCHAIKOVSKY "Waltz of the Flowers,” from the Ballet “The Nut Cracker Suite.” Listening to his interpretation of the popular waltz. played “his way” with octaves arpeggios and embellishments, invigorated the audience. Played by the artist, TCHAIKOVSKY's melody appeared to jump from the restrains of the keyboard and take a life of it own; and its sound, could only be described as marvelous. Being a virtuoso pianist, VYACHESLAV GRYAZNOV interprets his music, which is different than simply playing, because interpretation requires perfect phrasing. In his case, his "touch" of the piano keys is gentle, but the dexterity in the pianist’s fingers is so precise, that it allows his audience to listen every single note he plays on the piano. VYACHESLAV GRYAZNOV is on the faculty of the Moscow Conservatory and a visiting professor of piano at Japan’s Kurashiki Sakuyo University of Science and Arts. In 2016 he entered Yale University at their invitation, and was awarded the Artist Diploma in 2018. He now gives concerts in Europe and USA and his His transcriptions for piano are published by Schott Music, internationally. For information of STEINWAY SOCIETY THE Bay Area up coming concerts go to https://steinwaysociety.com/.